Rabi Pirzada Brutually Slams Pakistani Cricketers For Preferring TVCs Over Cricket! Pakistan’s loss to India ICC Champions Trophy 2017 started a debate amongst cricket fans. The nation was hurt over team’s dreadful performance and people are taking to social media to share their thoughts. The latest one to hit the cricket team is singer Rabi Peerzada. 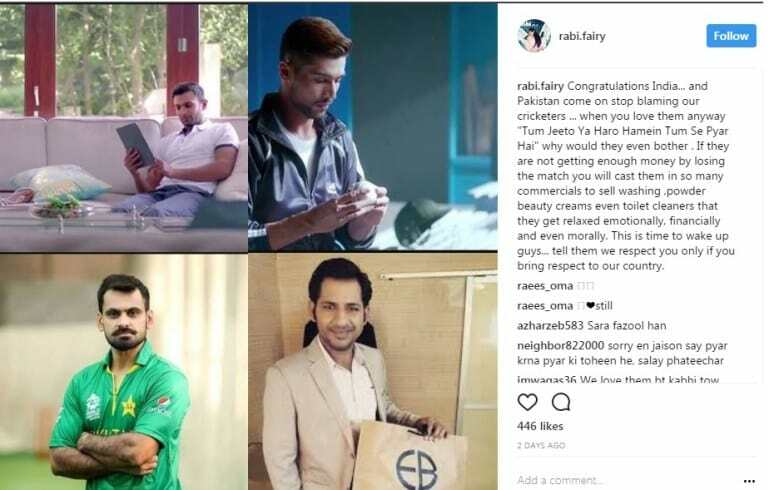 The singer who did a disastrous rendition of Nusrat Fateh Ali Khan’s classic took to Instagram and wrote an infuriated note to address the Pakistan cricket team. Congratulations India on a historical winning… wake up Pakistan cricket team… practice more than acting in commercials ???? Some of her followers opposed her while others supported her. What do you have to say about this?